Adega do Cartaxo produces this Encostas Do Bairro , a red wine from the region of Tejo made of trincadeira preta and castelão frances grapes. 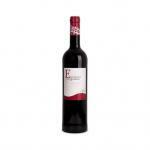 The Encostas Do Bairro is the ideal red to combine with meat. 4,2 of 5 points is the average score of this red according to Uvinum users. What's the evaluation of the Encostas Do Bairro?